How I've been feeling: TIRED. You know this is the exact same time of year when I was pregnant with Ella (Ella's b-day = 9/3....my due date = 9/5) so I'm going through all the same motions of the school year at the same point in my pregnancy. Example - this is not my first time going through "testing season" at work during the 2nd trimester. All I could say is thank goodness it didn't fall during the 1st...because I don't think I could have functioned during all those late nights if queasiness was thrown into the mix. Regardless of the fact that I'm through the 1st trimester, the tiredness remains. Everything takes extra effort! By the end of the day my body is just completely shot! I've also been getting headaches, although not nearly as frequently as I was a few weeks ago, they still pop up from time to time. Trying to stay hydrated...surely that helps! How I've been sleeping: Not too bad, I am a little restless at night but nothing major. I've been trying to sleep on my side but it's not easy to stay that way all night long. I haven't busted out the body pillow just yet, but soon! Food and exercise: My excuse is that testing season caused me to eat HORRIBLY...but the truth is I wasn't eating fantastic even before that. The 1st trimester brought nothing but late in the day nausea, and I ate mostly grilled cheese and cinnamon toast crunch. Once I started to get into testing, it was a lot of fast food. Ugh, talk about one extreme to the other. It drives me nuts that I was eating 1,000,000 times better when I was "eating for one". Major guilt...blah, blah, blah....I'm over it. I'm through the rough patch and making MUCH better choices. Work in progress, people! Oh and exercise....I've done some Beachbody Active Maternity workouts, a little yoga, lots of stretching, some running here and there but there is no actual routine. Another work in progress. We'll get there! Maternity clothes: I dug out all the old stuff which was NOT in the best shape. I broke down and splurged on a trip to Motherhood. I've been wearing mostly all maternity clothes for weeks now not just because it's more comfortable (obviously) but because I invested in it...so I'm using it! Movement: I can say that in the past week I've gone from just feeling like there's a little fishy swishing around in there to feeling actual kicks! They aren't too frequent but some are pretty strong...I was able to SEE it earlier today! Can you believe this strong little lady!? She's incredibly active! Best moment this past week: There are two! 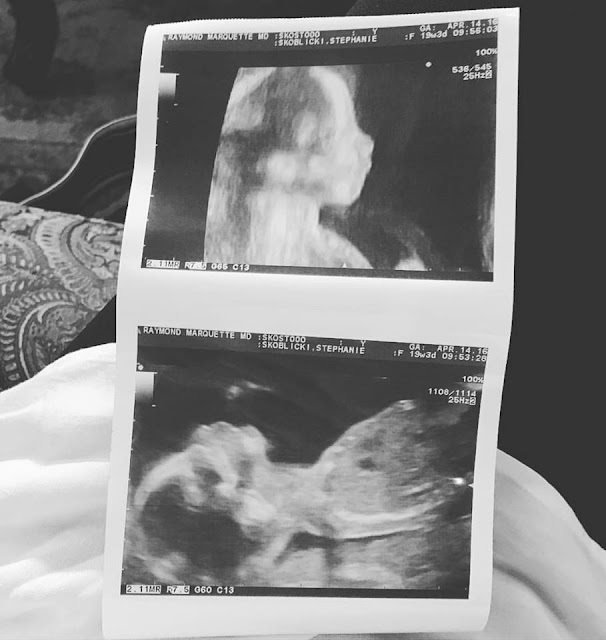 First was Monday night when I told Ella that I felt Baby kicking, she literally cracked up and kept saying "baby is so silly"....it was adorable to see how excited she was!!! And the other moment was this morning with Hubs....seeing this pretty face! Such a cute profile... just like Sissy! That's all for my first official bumpdate for our second sweet girl! Almost halfway there already! Whoa...it's definitely going faster this time! 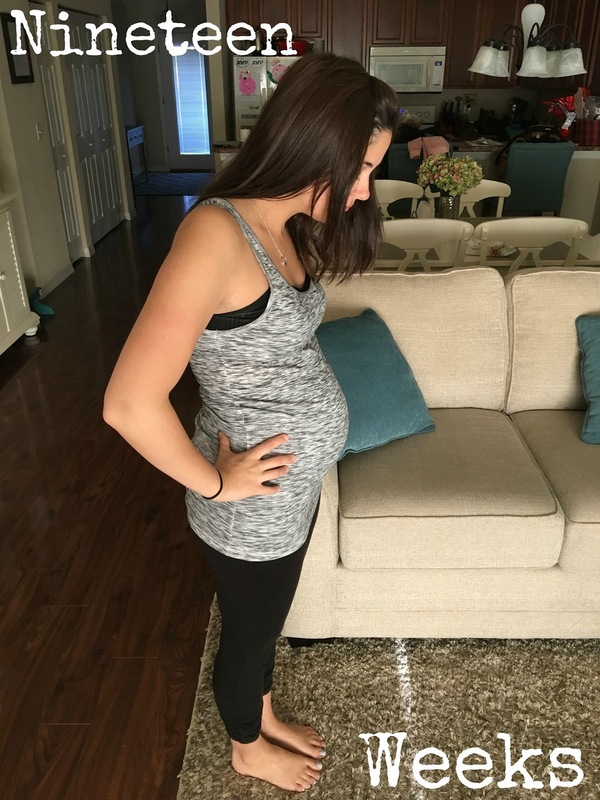 Click HERE to check out 19 Weeks with Ella Rose!